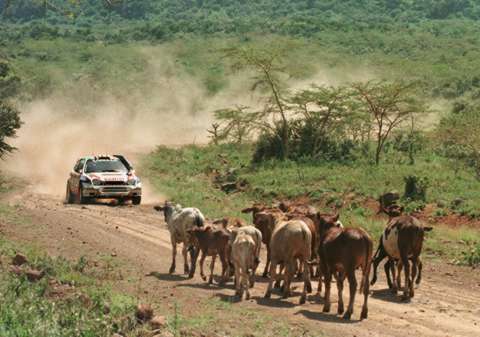 Safari Rally was an event of such classic stature that only Monte Carlo can be safely said to be equal. First run in 1953 to honor the coronation of Queen Elisabeth II, it soon became known as endurance event par excellance apart from marathons like London-Sydney. From 5300 kilometers in 1973, route shrunk little by little almost yearly but Safari was in a class of it's own when it came to competitive distance. 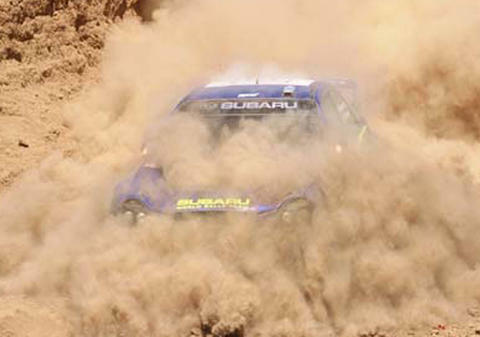 Dubbed as "the worlds toughest rally", event was a test of man and machine. As is obvious from the selection of pictures on right, story of Safari cannot be described in simple terms or quickly. Weather played important part, no matter how it turned out. If it was wet, mud was everywhere and progress slowed down considerably. If it was dry, dust became a problem. It was not uncommon for a driver to complain that he had catched slower car but had been unable to pass, or even approach because of the dust. Animals, both wild and domestic were a danger in the vast African plains. On open ground animals were easy to spot even without the helicopter support but in bushes the situation was different. 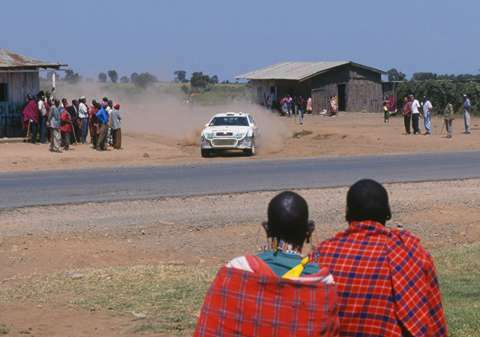 Besides the nature, character of the roads, long distances and high speeds, Safari was unique because it was the last WRC rally to run on open roads. Admittedly traffic was scarce but meeting a matatu, full-laden and slow local bus, caused more than one accident. 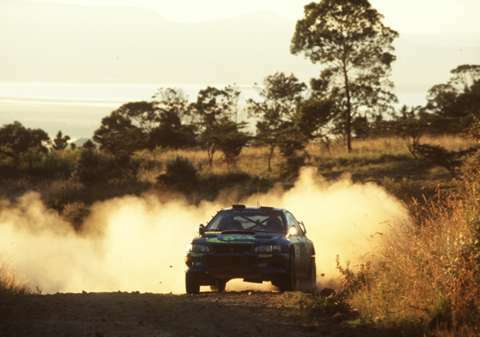 As emphasis on World Rally Championship moved ever more towards performance, Safari remained an endurance event where restraint usually paid off. This approach was first discarded by Mitsubishi in 1996 when team had concluded during testing that by routinely changing all suspension components in every service, their car would last the distance even with 100% speed. Times changed and world rallying with it. Move towards cloverleaf format with single service park and shorter overall distance did not suit well with the spirit of Safari and event was eventually dropped in favour of Turkey. Many fans and traditionalists were shocked but there was silent relief amongst teams. 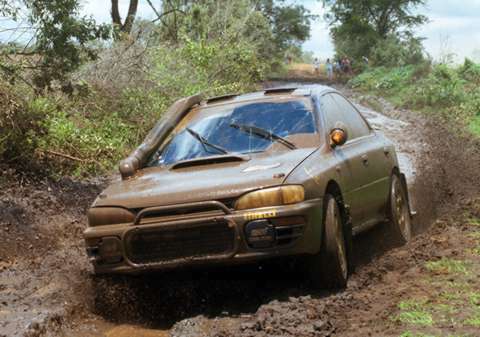 Safari was unique challenge but contesting it consumed by far more resources than any other rally, being great strain for the teams. Wet weather meant mud. A lot of mud. Dry weather meant dust. A lot of dust. Animals were an ever-present danger. 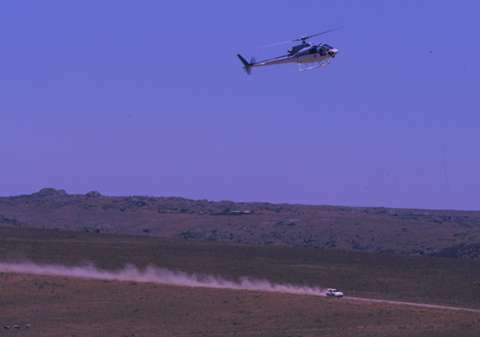 Helicopters were used to warn the competitors of the many dangers. Believe it or not, 200 kph on open roads and through the villages! Despite all dangers and hardship, Safari was event of natural beauty.